Depend® Active-Fit Incontinence pants are designed to help maintain an active lifestyle. Unique cotton-like fabric that leaves you feeling fresh all day. Protection against bladder leakage with elastic legs to help keep you dry and secure. Moderate/ Heavy absorbency that locks in odour. Specifically designed for the shape of a woman, featuring a low rise for true underwear fit and discretion.Depend® Active-Fit incontinence pants for women has Motion-Flex technology for discreet and comfortable protection even when active. The lightweight, peach cotton-like fabric smoothly flexes with your body for a perfect, secure fit so you always feel fresh and comfortable. Ideal for medium/ heavy bladder leakage, Depend Active-Fit® Incontinence Knickers feature maximum absorbency to help maintain a healthy lifestyle and give you day-long confidence. 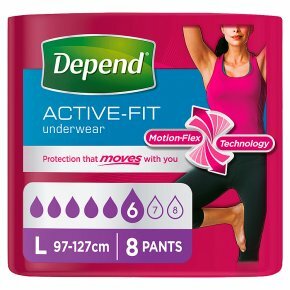 Depend® ladies incontinence pants for an overactive bladder feature odour eliminating technology and are low rise for a true underwear fit and discretion. Dispose of after use. Non-washable. Non-flushable.